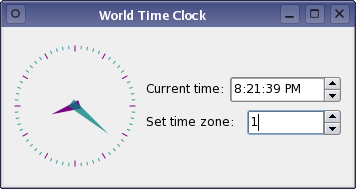 This example uses a form containing the custom widget plugin described in the World Time Clock Plugin example, and dynamically generates a user interface using the QUiLoader class, part of the QtUiTools module. As with the Calculator Builder example, the project file for this example needs to include the appropriate definitions to ensure that it is built against the required Qt modules. By appending form to the CONFIG declaration, we instruct qmake to generate a dependency on the libQtUiTools library containing the QtUiTools classes. Forms do not need to be included with the application in this way. We only include a form in the application's resources for convenience, and to keep the example short. We construct a QUiLoader object to handle the form we want to use. Once the form has been loaded, the resource file can be closed and the widget is shown. The form loader ensures that all the signal and slot connections between objects in the form are set up correctly when the form is loaded. As a result, the time is updated by the World Time Clock widget, and the time zone spin box can be used to change the position of the hour hand.